Ripplecast 2012 is a newly developed version in a series work. In this version its software environment is changed from Java to Processing environment, and expands its video screen widely to make viewers immersed in the experience with the nature. Therefore, now it creates more natural interactions when several interactors are engaged in the work at the same time, by deregulating each player's interaction range in a free way. The video imagery is also changed to present more realistic images by the changing season. series of work attempts to provide a calm engagement and a chance to encounter nature in an interactive media art experience. 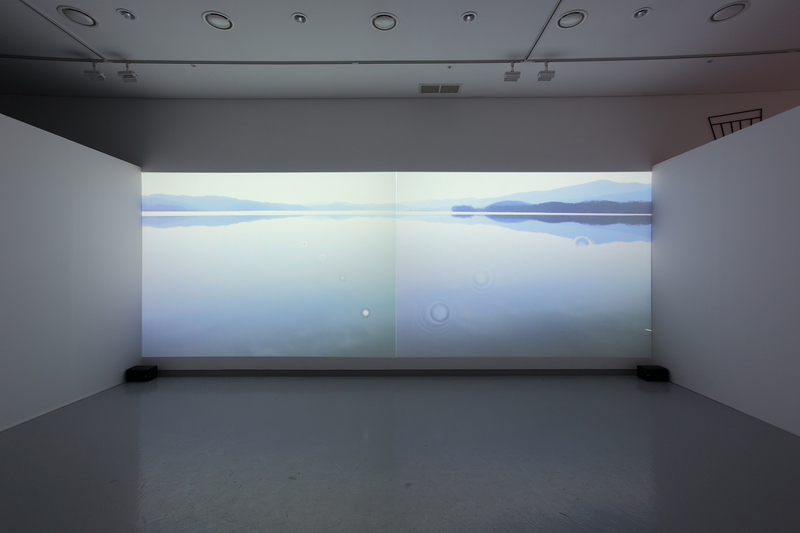 As if the interactors were standing on the shore of a lake, the projected image of a still pond on the big gallery wall laid waiting for viewers. In , the interaction with the WiiRemote is designed to mimic the movement of throwing stone that we do with our hands. Similar to the way we grip a real stone with our fingers, holding the WiiRemote and pressing the big button on the bottom of it, interactor can release a virtual stone. As a result, ripples form on the surface of the still pond depending on where the interactor throws the stone. Based on the strength and degree of the throwing motion, the stone skips, making one or more hops. Although certain movement, directions, and speeds are programmed to get better results, since the WiiRemote is used at a distance from the screen and gestures are also made up in the air, the mappings between the gesture motion and the result of the interaction are not explicitly revealed to the viewer. Rather, aims to invoke a reflective mode of user experience by leaving an element of arbitrariness in the cause and effect relationship. This suggests to the interactors that they should look back on their body and mind from a distance, and bring their own memories and experiences with nature to their current interaction with the piece. <물수제비던지기 2012>는 <물수제비던지기> 시리즈 작업이 계속 진화발전하고 있는 형태의 작업이다. 이번 작업은 이전과 다르게 좀더 몰입적이고 자연적인 교감을 확대하기 위해 영상화면을 확장하였고, 지난 버전까지 사용한 Java 프로그램을 processing 체제로 새롭게 바꾸어 다수의 인터렉터가 함께 작품과 소통할 때 그러한 인터렉션이 자연스러워질 수 있도록 각각의 인터렉터의 인터렉션 범위 설정에 변화를 주며 좀더 자연스런 위(Wii) 인터렉션을 추구하고자 하였다. 또한 영상을 계절에 맞추어 변화하는 자연적 풍경으로 바꾸며, 자연과의 조우의 기회를 좀더 시간의 흐름에 맞게 제공하고자 기획하였다. 기본적으로 <물수제비던지기>는 자연을 조용하게 조우할 수 있는 기회를 제공하고자 접근된 인터렉티브 미디어 작업으로 관객은 작품 앞에서 마치 호숫가 앞에 서 있듯이 잔잔한 호수 이미지를 마주하게 된다. 그리고 잔잔한 수면위에 물수제비를 뜨는 것과 유사하게, 닌텐도의 게임 콘트롤러인 위리모트(Wiiremote)를 가지고 손과 손목의 스냅을 이용 가상의 돌을 호숫가에 던질 수 있게 유도하였다. 가상의 돌이 잔잔한 호숫가 수면 위로 던져지면, 던지는 모션의 속도와 각도 등에 따라 좀더 많은 혹은 좀더 적은 물수제비가 떠지도록 프로그램화 하였다. 그러나 이러한 인터렉티브 프로그램이 항상 예측가능한 동일한 결과를 가져오기 보다 본 작업은 인터렉티브 미디어아트 경험에서의 인터렉션의 원인과 결과의 고리에서 조금은 열린 관계을 형성함으로써 관객들로 하여금 자기 반영적 모드, 즉, 자신의 몸과 마음을 어느 정도의 거리를 두고 바라보도록 유도하려 하였다. 스크린과 상당한 거리에서 개별 인터렉터들이 허공에서 취하는 위리모트 인터렉션 동작에 의해 나타난 행위의 결과는 실제 자연에서의 물수제비던지기와 같이 예측할 수 없으나, 그들의 유년 시절 자연과 함께한 추억의 경험으로 떠올릴 수 있기를 바란 것이다. Under the four themes such as"Energy, Rhythm, Animate, Dynamic,"
each theme was to be presented at the separated installation room. 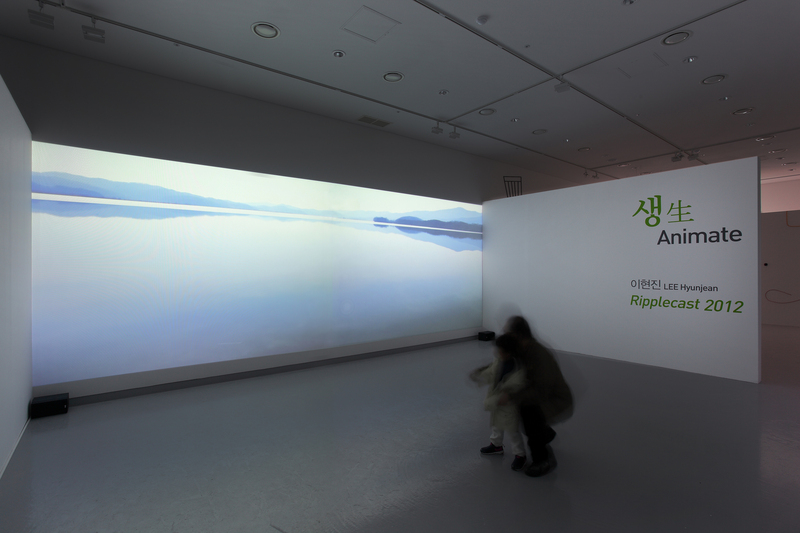 And among them, this work is presented for the "animate" room under the exhibition theme.